Normally, each woman produces an egg in each menstruation period. 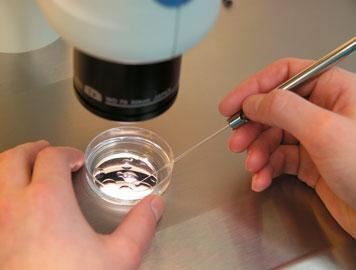 The approach applied for in vitro fertilization to date involved production and fertilization of multiple eggs and transfer multiple embryos in order to increase the chances of conception. However, multiple medications are used with this method, causing side effects (such as abdominal pain, nausea) for the woman and increasing the treatment costs. Egg cells produced by women during normal menstruation are used for the natural-cycle in vitro fertilization. The egg created during menstruation, i.e., the egg selected naturally is used for the in vitro fertilization procedure. The important aspect of this procedure is the fact that the egg is not obtained with medication, but it is selected naturally in that month. Patients who will receive this treatment must be under 38 years of age and their ovarian capacity must be sufficient and size / weight ratio must be within normal limits. Side effects caused by medication (abdominal pain, nausea) are not observed. Diseases caused by excessive stimulation of the ovaries (OHSS) are not observed. Hormone levels are not increased dramatically; therefore, blood samples are taken rarely during the treatment. · The patients visit the clinic less; therefore, the daily routine of the patient is not affected and adaptation to the treatment is facilitated. The egg retrieval procedure takes 5 minutes and patients are discharged 15 minutes after the operation as a light anaesthesia is applied. There is a possibility of cancelling the treatment during egg retrieval, fertilization and division due to less number of eggs. The pregnancy rate is no different than conventional in vitro fertilization. However, the number of embryos for cryopreservation may be limited. We do not recommend this treatment to patients with low ovarian capacity and above at certain age. Duration that our patients are required to spend at our clinic during the treatment, which is 10 to 12 days in total, is half an hour for each visit which is in total 2 to 3 times. Drug cost of this treatment is lower by 30%. Do the success rate for the comfortable IVF differ from other treatment types? The comfortable IVF does not decrease pregnancy rates. Is this method currently used as a common method in Turkey? As it is a brand-new method and recently started to spread world-wide, this method is available only in a limited number of IVF centers and with good laboratory in Turkey.